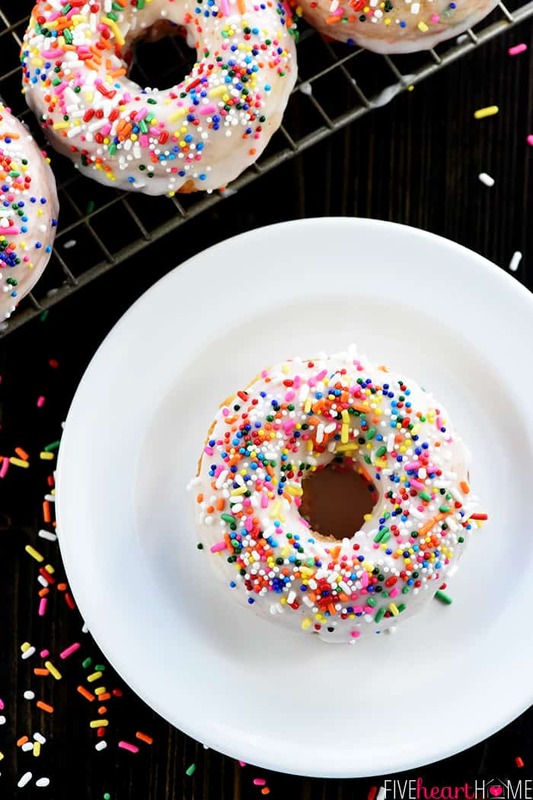 Funfetti Baked Donuts are coated with a simple vanilla glaze and loaded with colorful sprinkles, perfect as a birthday treat or for any celebration! Happy March, friends! March means that spring is almost here, right? Right??? Because I am so ready. 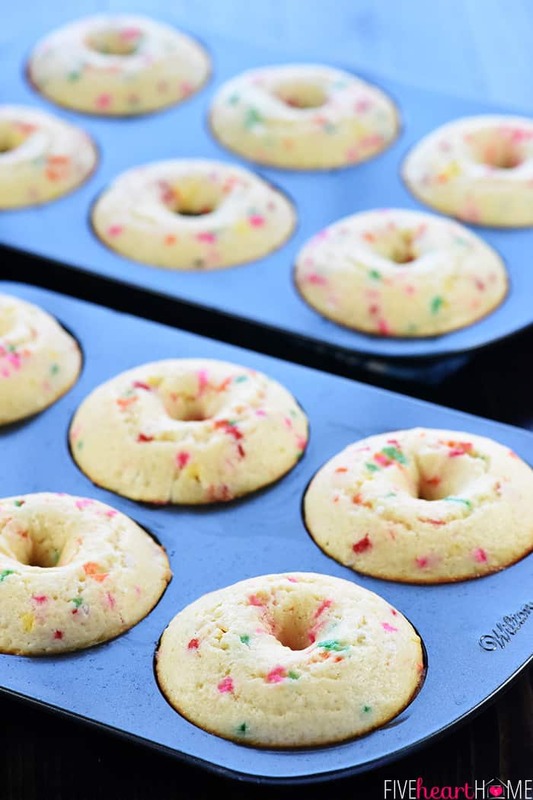 In fact, at the first sign of spring, I do believe we’ll be celebrating ’round these parts with some Funfetti Baked Donuts! Like any good red-blooded, American children, my kids are obsessed with donuts. But since fried donuts are pretty much sugar and fat bombs, we only indulge in them occasionally. In the interim, however, I’m not a complete and total mean mom. I occasionally make baked donuts for my family as a slightly less guilt-inducing sweet treat. And the thing is, my kiddos love them. As in, they’re just as excited when I make baked donuts as they are when we pick up a dozen glazed beauties from the donut shop. 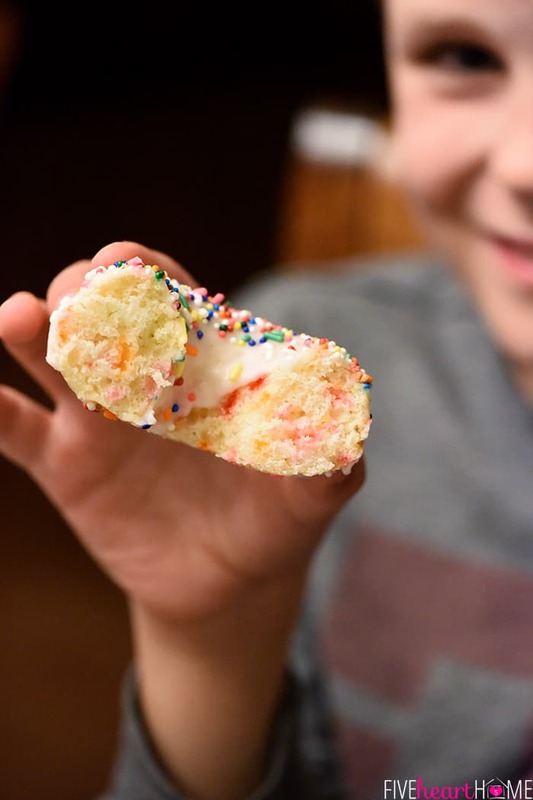 And I can confidently say that these Funfetti Baked Donuts are their favorite type of baked donuts yet! And who wouldn’t love them? 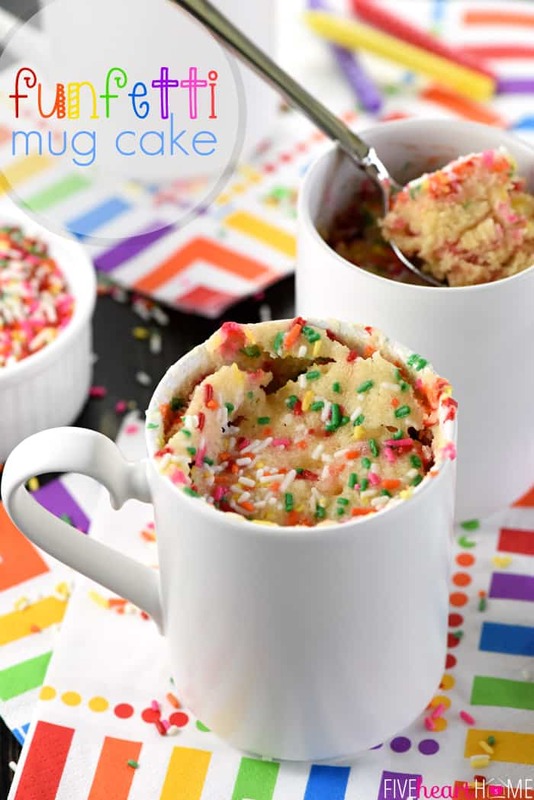 Because the batter is not only quick to stir up, but it’s also studded with a rainbow of festive sprinkles. 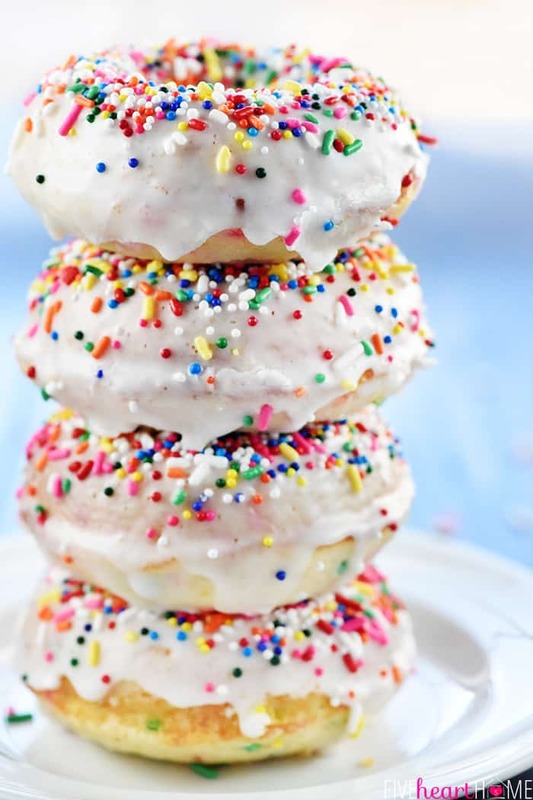 Then, once the donuts are baked and cooled, they get glazed with an easy-peasy icing (powdered sugar + milk) and topped with yet more sprinkles. How. Fun. Are. THESE?! 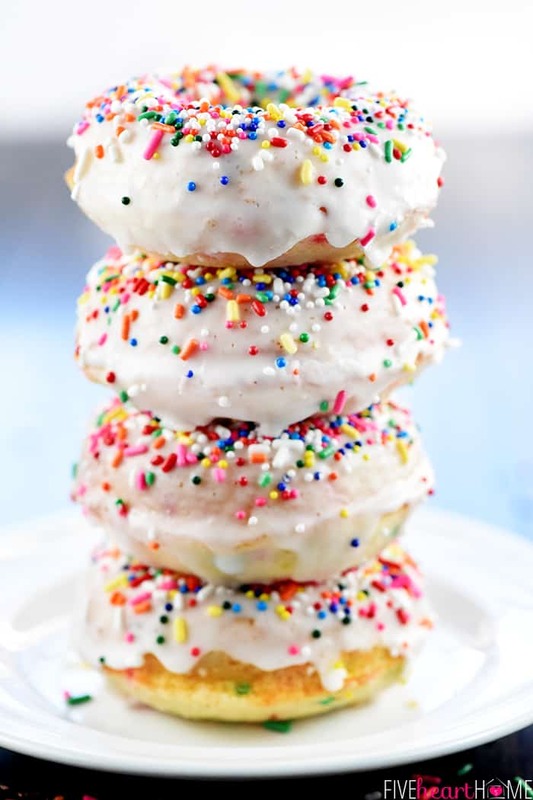 The resulting Funfetti Baked Donuts are tender and fluffy on the inside, in contrast to the sugary glaze and crunchy sprinkles on the outside. 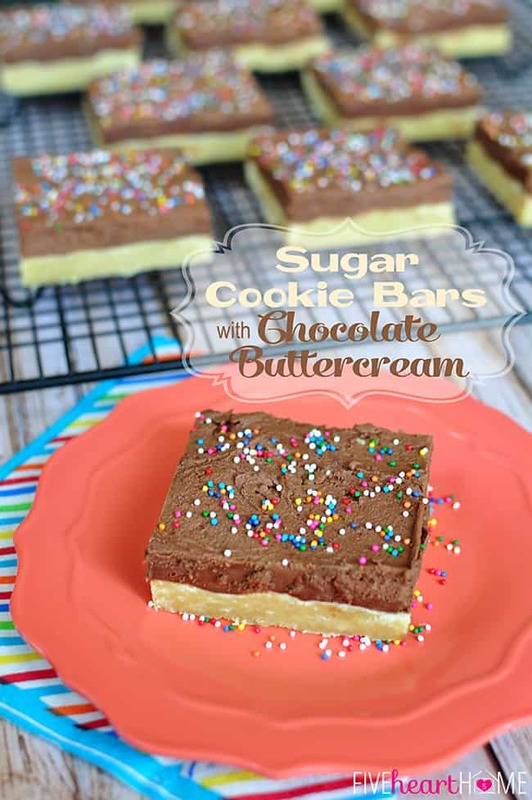 They’re sweet and indulgent and just plain happy. 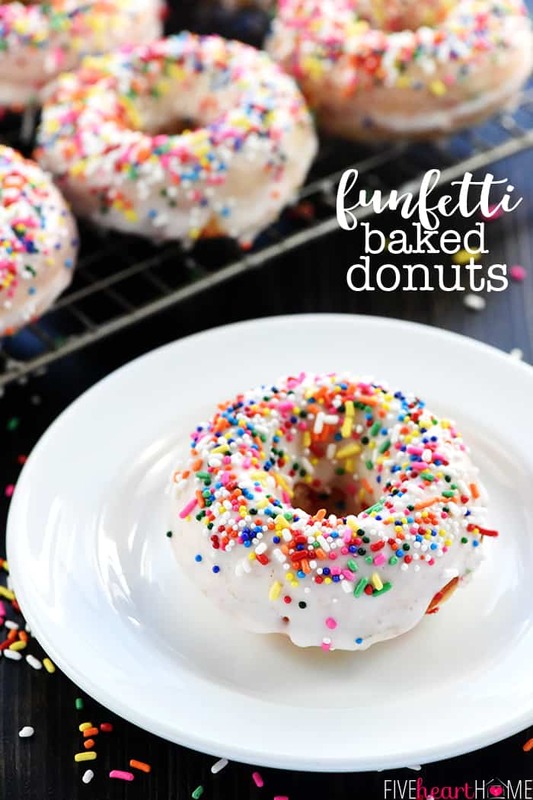 Their primary flavor is vanilla, but I also like to add a teensy splash of almond extract to both the batter and the glaze which gives the donuts a little extra something and, in my opinion, lends them even more of a birthday cake vibe. 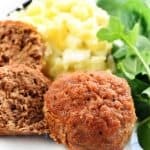 And since they’re baked instead of fried, you can eat three instead of one! Ha. Actually, in no way am I claiming these donuts to be health food. 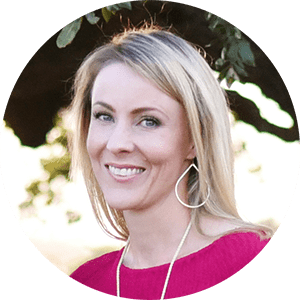 But they certainly fit the bill when you need a festive sweet treat that you can quickly whip up at home for a special occasion (or no occasion at all)! 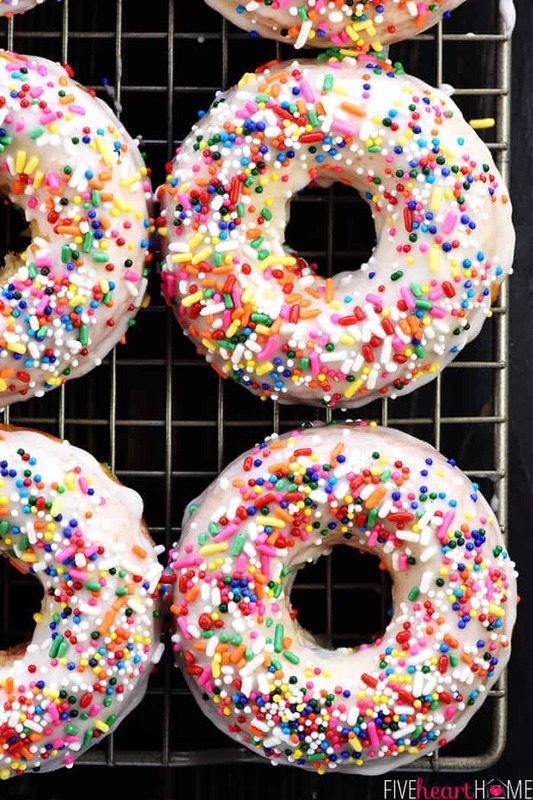 Use your favorite types of sprinkles! 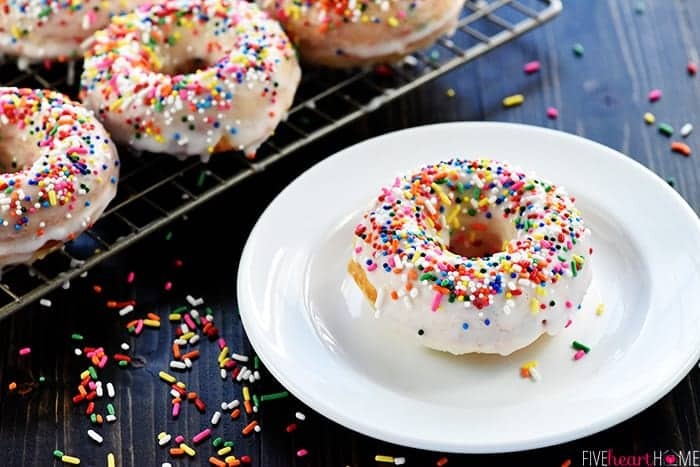 I actually use two types of rainbow sprinkles for my donuts: nonpareils (the tiny round ones) and jimmies (the long, cylindrical sprinkles). 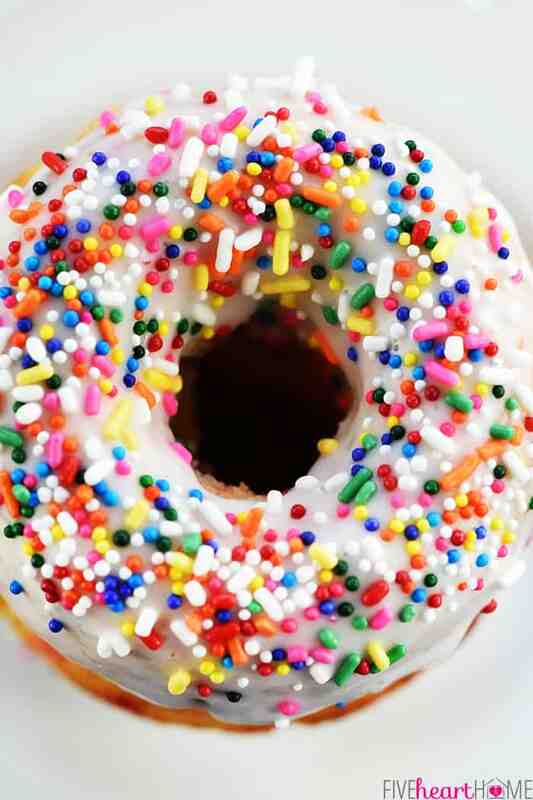 In my experience, nonpareils tend to bleed in the batter while jimmies do not. So I use jimmies in the batter and then sprinkle both nonpareils and jimmies on top of the glaze. 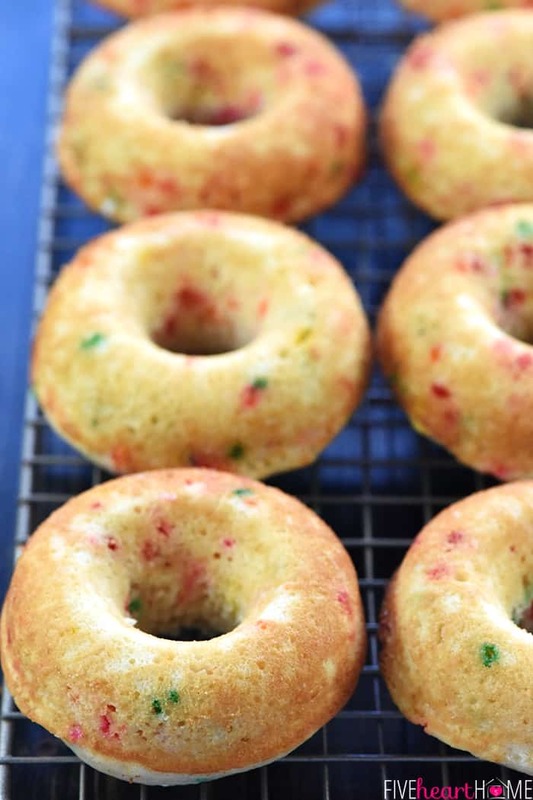 The cornstarch in this recipe lightens up the texture of the donuts, akin to using cake flour. 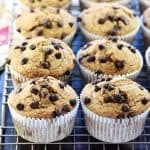 If you prefer, you may omit the cornstarch and increase the all-purpose flour to 2 cups. Or just use 2 cups of cake flour instead, if you happen to have it on hand. I prefer making my glaze pretty thick so that it looks white when it coats the donuts and doesn’t all drip down the sides. However, be wary of making it too thick, or it will pull apart your donut when you try to dip it! 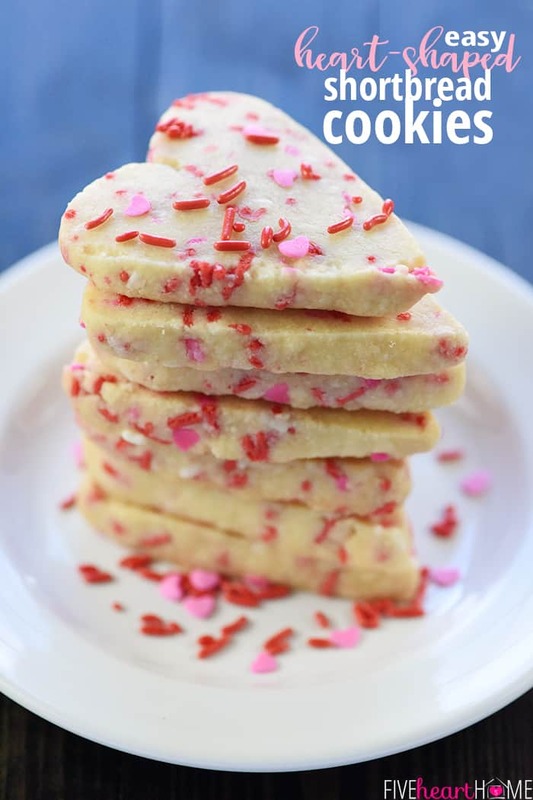 Start by adding 3 tablespoons of milk to the powdered sugar (along with the extracts), and then stir in an additional half teaspoon milk at a time until the glaze is just right. You can always add more powdered sugar or more milk if you go overboard in one direction or the other. 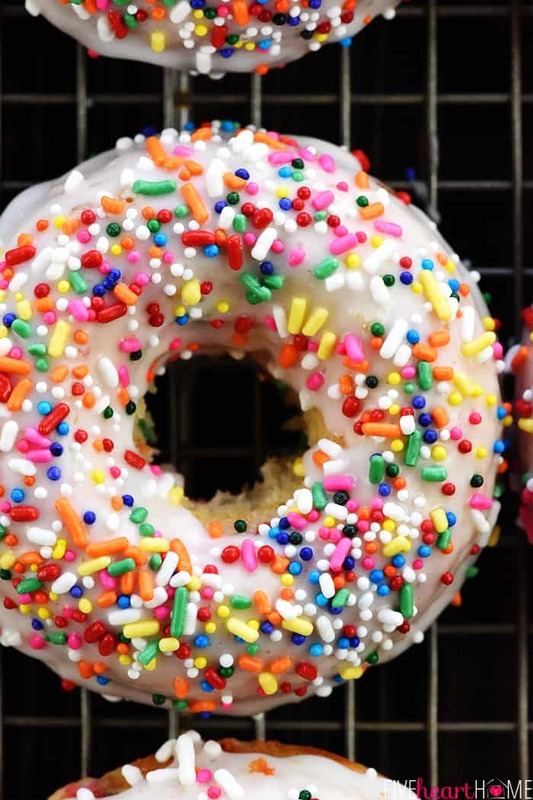 If you realize your glaze is on the thin side — and you have a lot left over after dunking your donuts once — you can dunk each donut in the glaze a second time for a thicker coating. Sprinkle the sprinkles on the glaze before the glaze dries (so that the sprinkles stick), and let the finished donuts sit for about 30 minutes (so that the glaze can completely set) before stacking or storing. 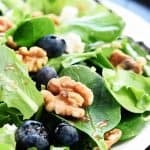 The almond extract in this recipe is optional, but I like the flavor it gives to the donuts (although a little bit goes a long way!). 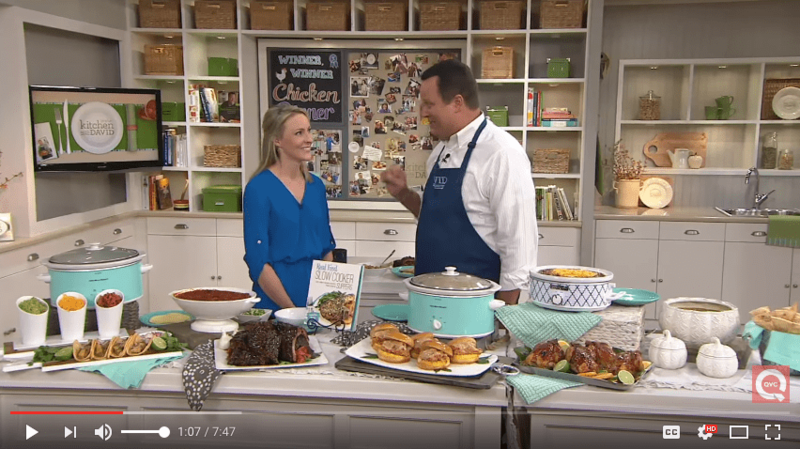 And while I recommend using pure vanilla extract in recipes 99.9% of the time, this is a recipe where you’ll need clear imitation vanilla extract for the glaze. I keep a small bottle in my pantry and only use it when necessary, which is rarely. 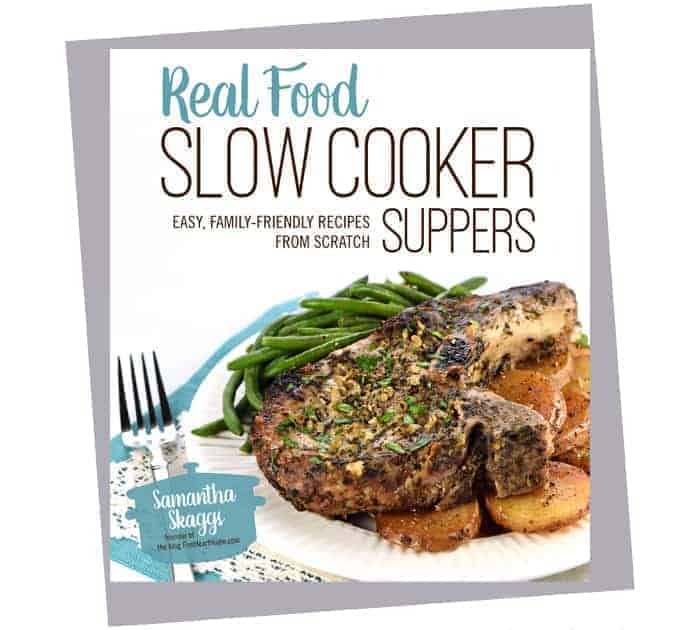 For this particular recipe, though, if you use pure vanilla extract in the glaze, the glaze will turn out tan instead of white. 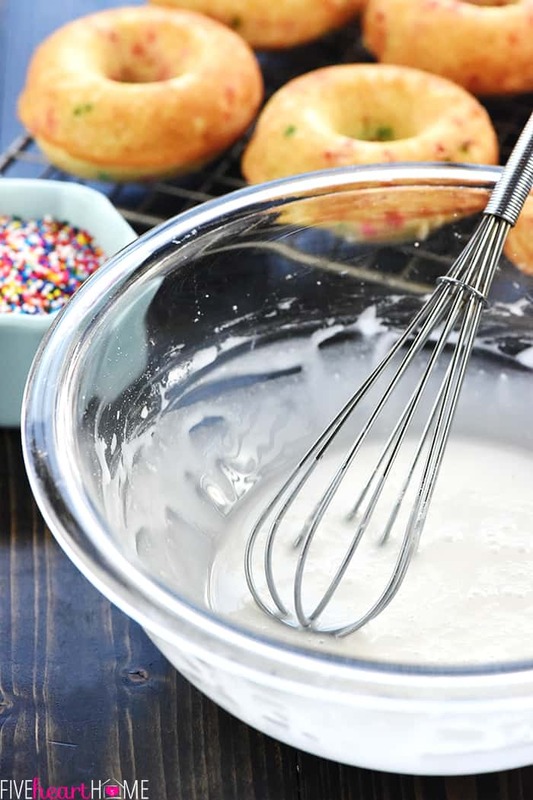 Place some wax paper or foil under the cooling rack to catch those sticky drips of icing (and simplify clean-up!) after you glaze the donuts. In a large bowl, whisk together the flour and cornstarch. Whisk in the sugar, baking powder, and salt until well blended. 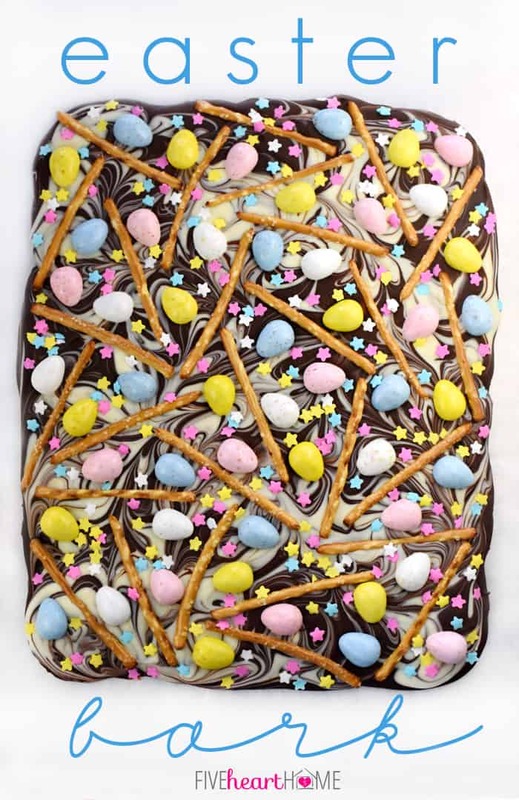 Stir in buttermilk, eggs, butter, vanilla, and almond extract until batter is smooth and combined, but do not over-mix. Quickly stir in the sprinkles. Evenly divide the batter between the prepared donut pans. Bake for 7 to 9 minutes until the edges of the donuts begin to turn a light golden brown and the tops of the donuts spring back when lightly touched. Cool the donuts for 3 minutes in the pans before turning them out onto a cooling rack, and then allow them to continue to cool while you mix up the glaze. Make the glaze by whisking together the powdered sugar, milk, clear vanilla, almond extract, and salt. If glaze is too thick, stir in additional milk -- 1/2 teaspoon at a time -- until the consistency is just right. 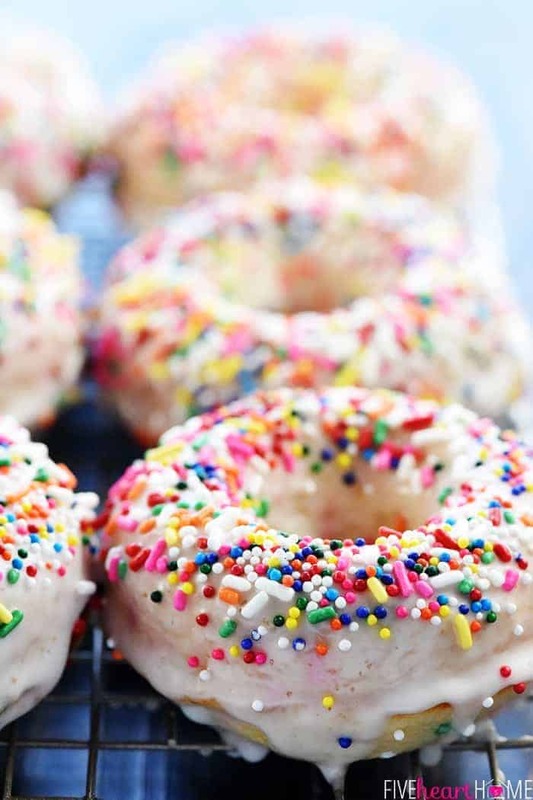 Dip one side of each donut into the glaze, set back on the rack, and immediately sprinkle with sprinkles. 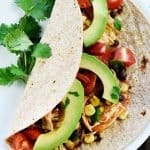 Allow to set for a few minutes before serving, or for at least 30 minutes before stacking or storing.